An Introduction to THE LETTER TO THE ROMANS. 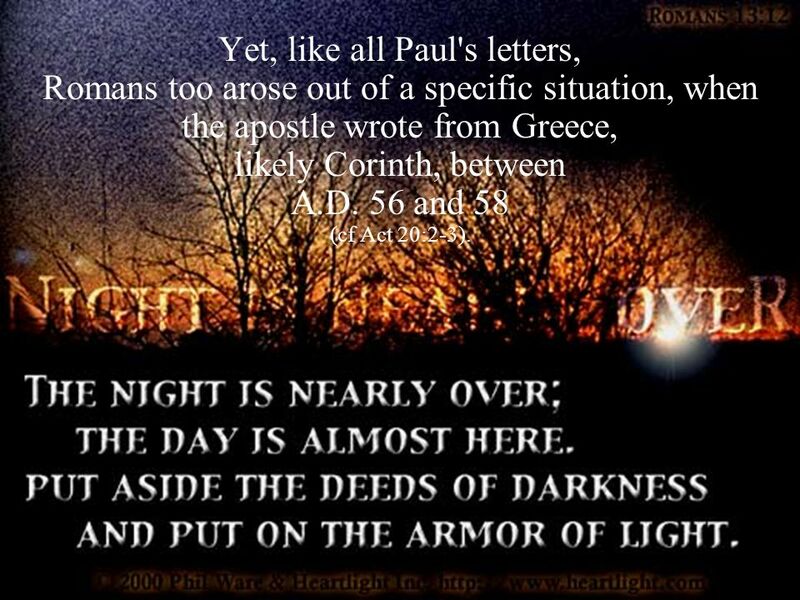 2 Of all the letters of Paul, that to the Christians at Rome has long held pride of place. 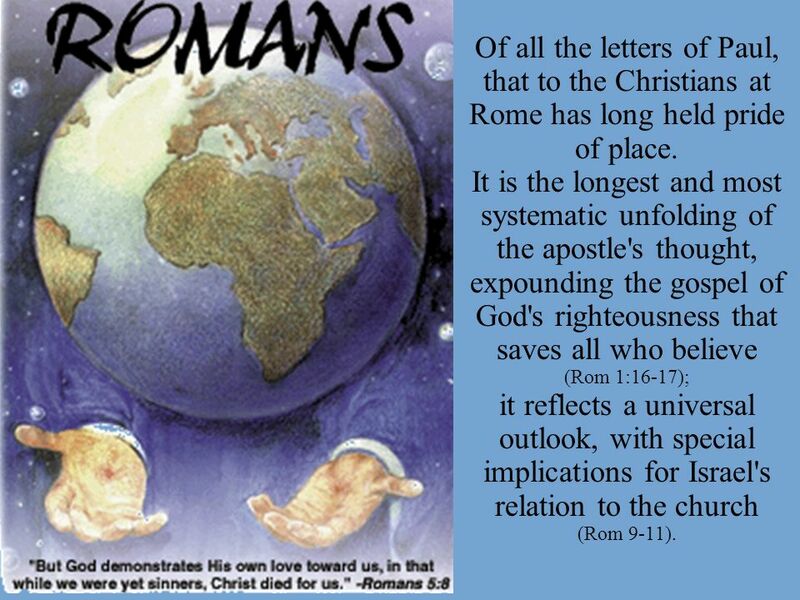 It is the longest and most systematic unfolding of the apostle's thought, expounding the gospel of God's righteousness that saves all who believe (Rom 1:16-17); it reflects a universal outlook, with special implications for Israel's relation to the church (Rom 9-11). Romans too arose out of a specific situation, when the apostle wrote from Greece, likely Corinth, between A.D. 56 and 58 (cf Act 20:2-3). Paul at that time was about to leave for Jerusalem with a collection of funds for the impoverished Jewish Christian believers there, taken up from his predominantly Gentile congregations (Rom 15:25-27). 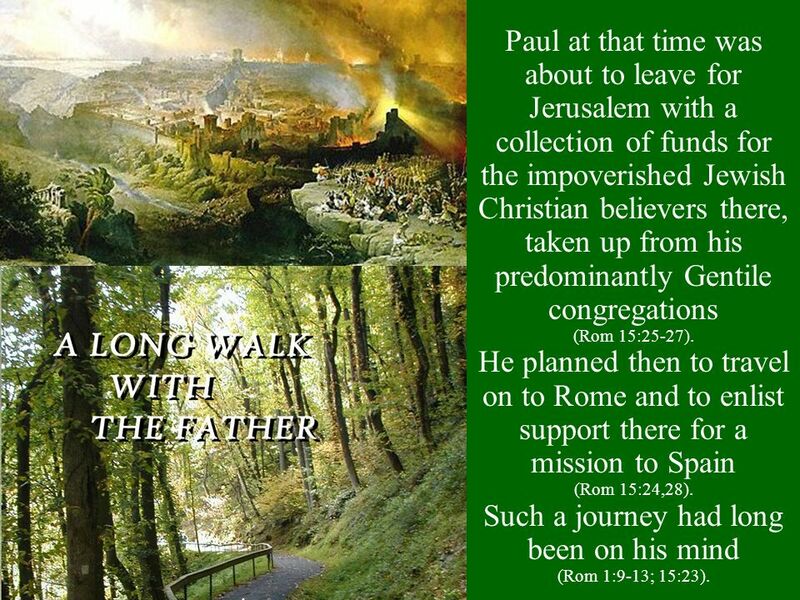 He planned then to travel on to Rome and to enlist support there for a mission to Spain (Rom 15:24,28). Such a journey had long been on his mind (Rom 1:9-13; 15:23). 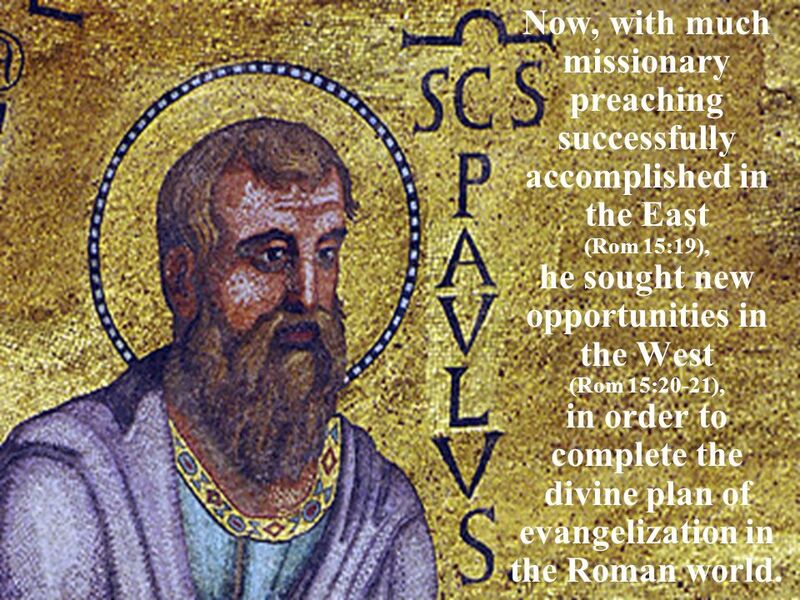 Now, with much missionary preaching successfully accomplished in the East (Rom 15:19), he sought new opportunities in the West (Rom 15:20-21), in order to complete the divine plan of evangelization in the Roman world. 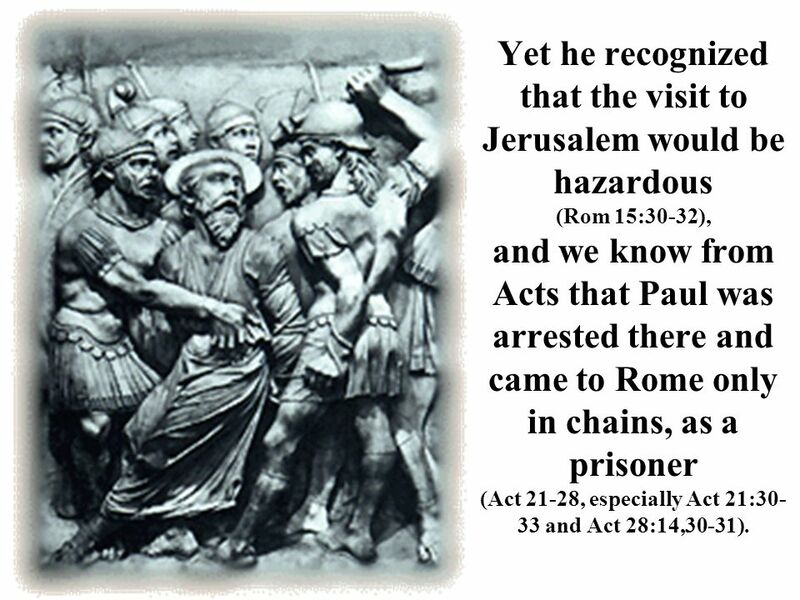 (Rom 15:30-32), and we know from Acts that Paul was arrested there and came to Rome only in chains, as a prisoner (Act 21-28, especially Act 21:30-33 and Act 28:14,30-31). 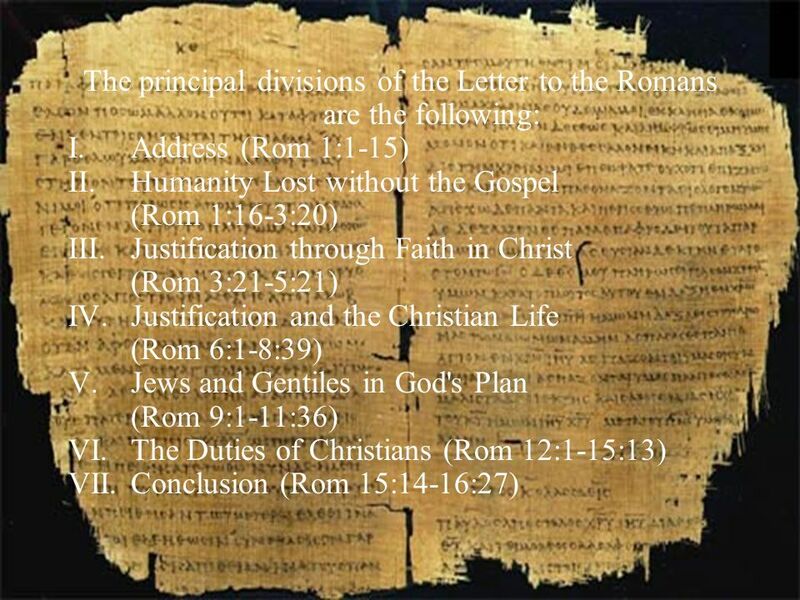 7 The existence of a Christian community in Rome antedates Paul's letter there. When it arose, likely within the sizable Jewish population at Rome, and how, we do not know. 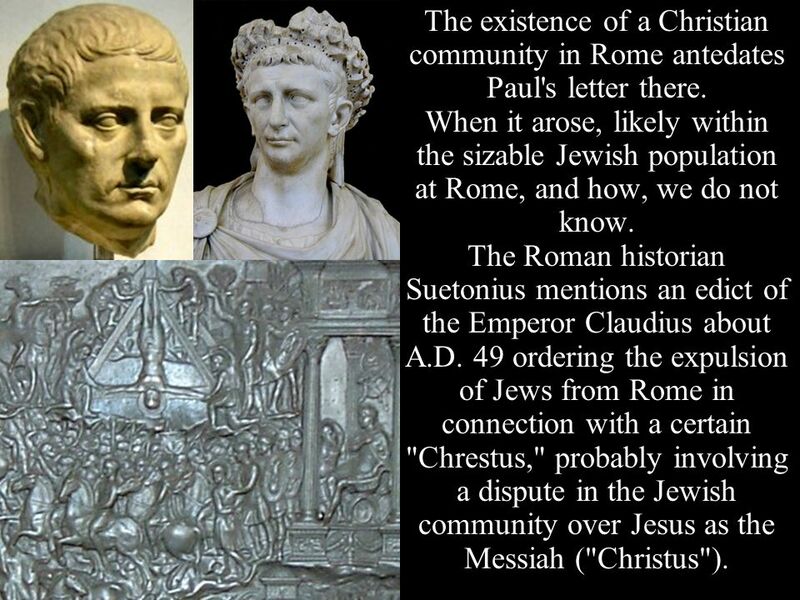 The Roman historian Suetonius mentions an edict of the Emperor Claudius about A.D. 49 ordering the expulsion of Jews from Rome in connection with a certain "Chrestus," probably involving a dispute in the Jewish community over Jesus as the Messiah ("Christus"). 9 Perhaps already by then Gentile Christians were in the majority. 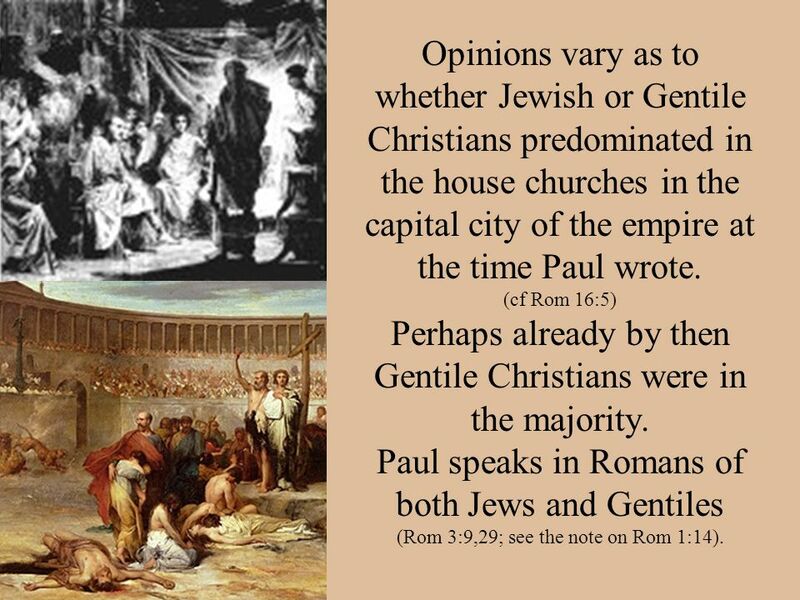 Opinions vary as to whether Jewish or Gentile Christians predominated in the house churches in the capital city of the empire at the time Paul wrote. (cf Rom 16:5) Perhaps already by then Gentile Christians were in the majority. Paul speaks in Romans of both Jews and Gentiles (Rom 3:9,29; see the note on Rom 1:14). 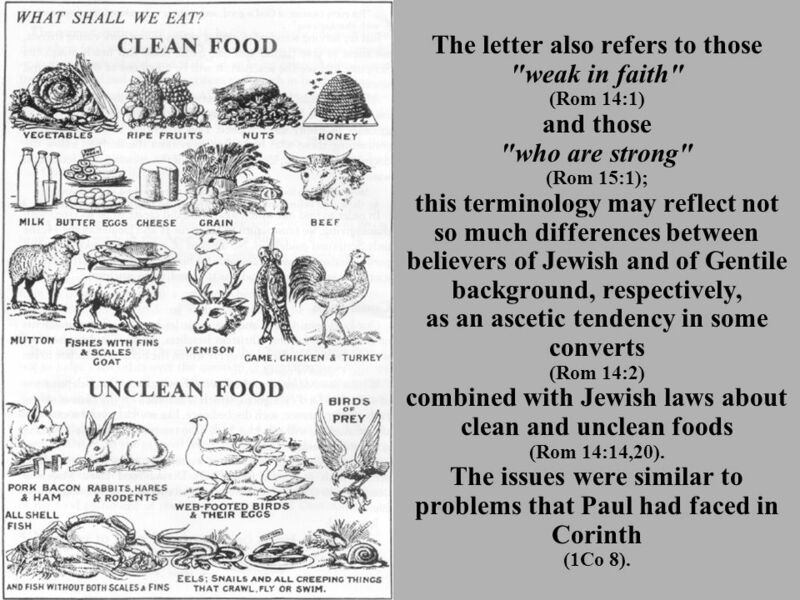 (Rom 14:1) and those "who are strong" (Rom 15:1); this terminology may reflect not so much differences between believers of Jewish and of Gentile background, respectively, as an ascetic tendency in some converts (Rom 14:2) combined with Jewish laws about clean and unclean foods (Rom 14:14,20). 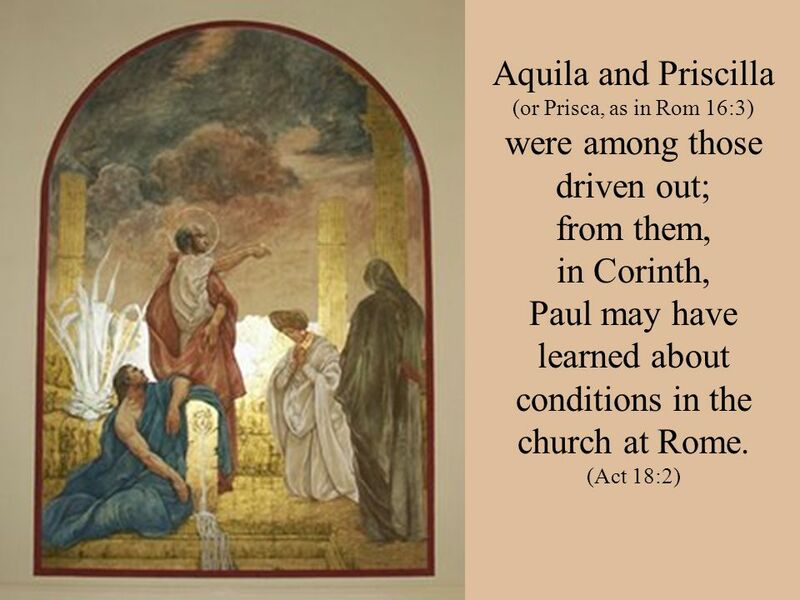 The issues were similar to problems that Paul had faced in Corinth (1Co 8). 11 seeking to enlist their support for the proposed mission to Spain. 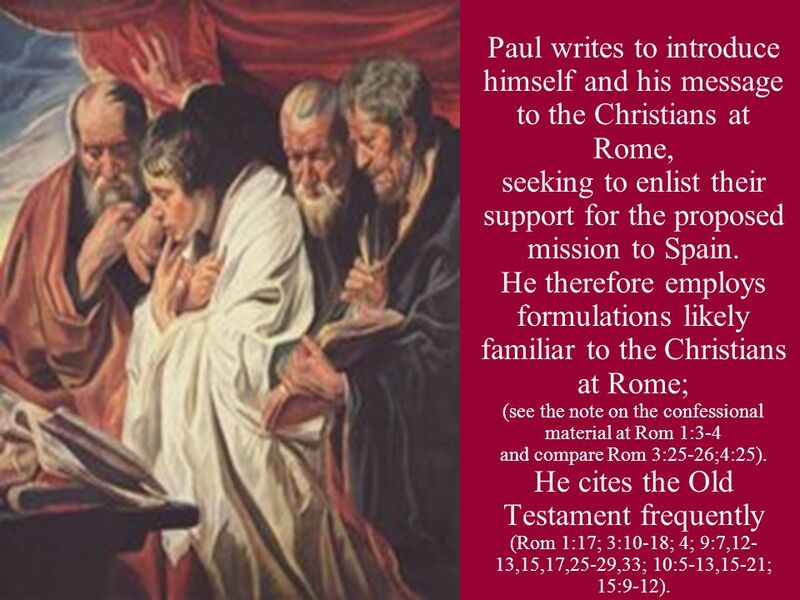 Paul writes to introduce himself and his message to the Christians at Rome, seeking to enlist their support for the proposed mission to Spain. He therefore employs formulations likely familiar to the Christians at Rome; (see the note on the confessional material at Rom 1:3-4 and compare Rom 3:25-26;4:25). He cites the Old Testament frequently (Rom 1:17; 3:10-18; 4; 9:7,12-13,15,17,25-29,33; 10:5-13,15-21; 15:9-12). 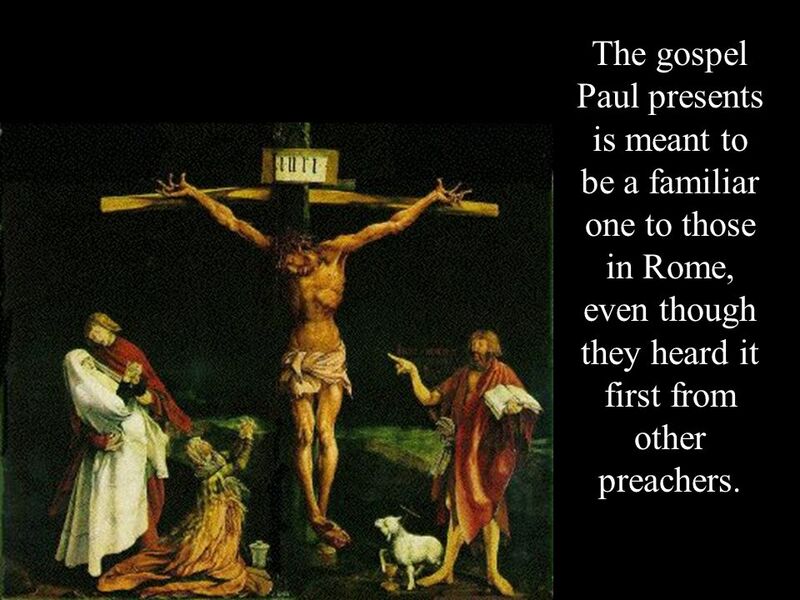 12 The gospel Paul presents is meant to be a familiar one to those in Rome, even though they heard it first from other preachers. 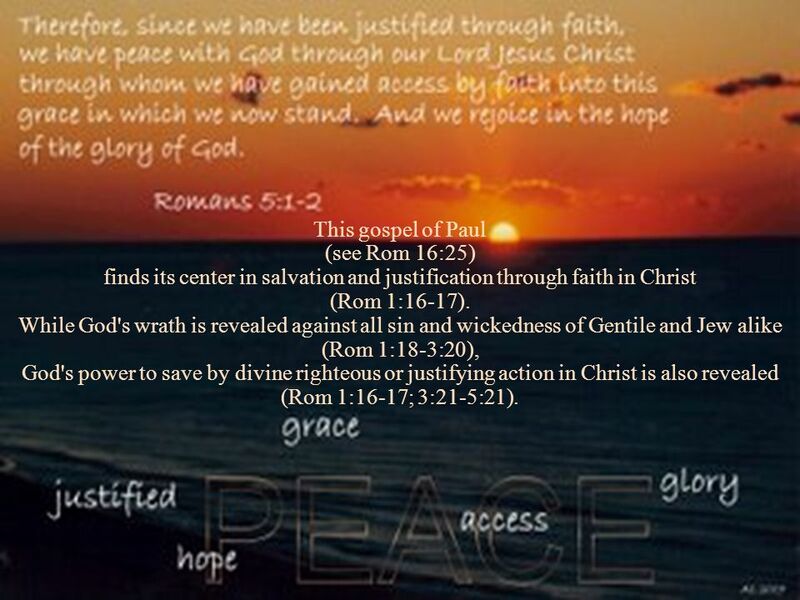 13 This gospel of Paul (see Rom 16:25) finds its center in salvation and justification through faith in Christ (Rom 1:16-17). While God's wrath is revealed against all sin and wickedness of Gentile and Jew alike (Rom 1:18-3:20), God's power to save by divine righteous or justifying action in Christ is also revealed (Rom 1:16-17; 3:21-5:21). 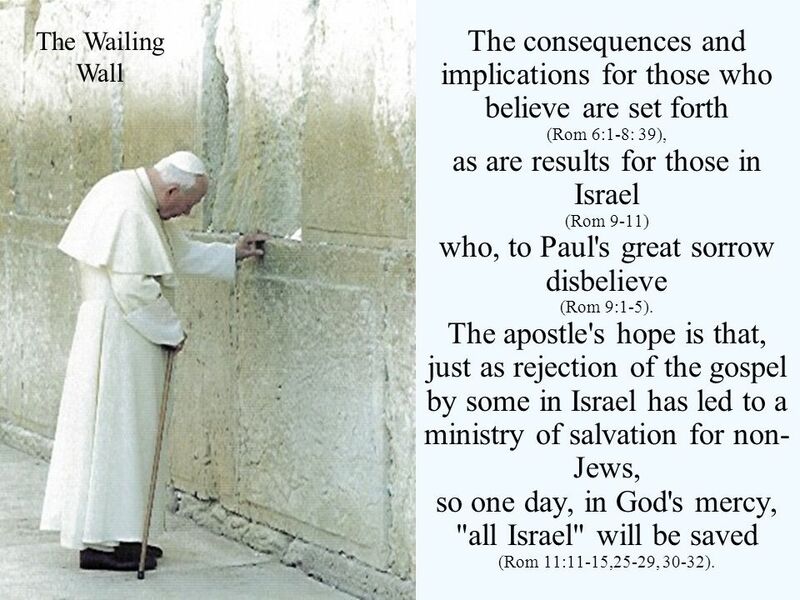 The Wailing Wall The consequences and implications for those who believe are set forth (Rom 6:1-8: 39), as are results for those in Israel (Rom 9-11) who, to Paul's great sorrow disbelieve (Rom 9:1-5). The apostle's hope is that, just as rejection of the gospel by some in Israel has led to a ministry of salvation for non-Jews, so one day, in God's mercy, "all Israel" will be saved (Rom 11:11-15,25-29, 30-32). 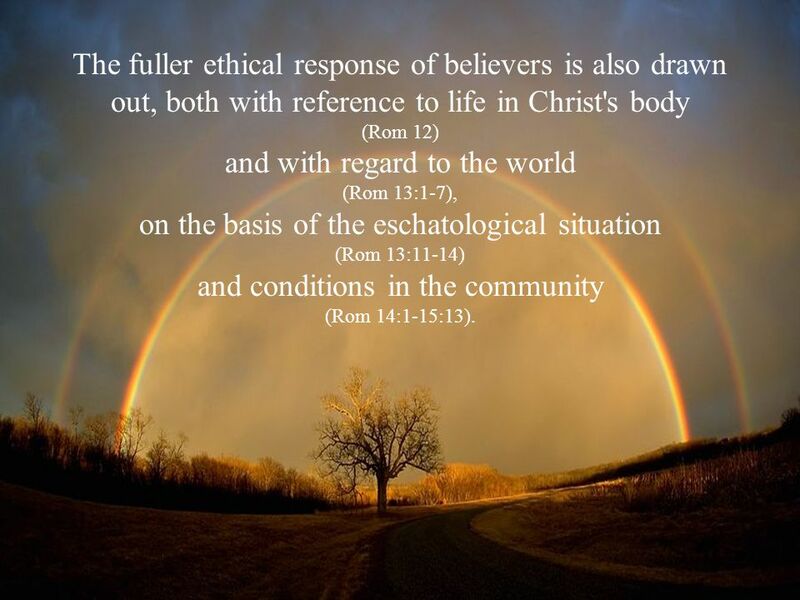 The fuller ethical response of believers is also drawn out, both with reference to life in Christ's body (Rom 12) and with regard to the world (Rom 13:1-7), on the basis of the eschatological situation (Rom 13:11-14) and conditions in the community (Rom 14:1-15:13). 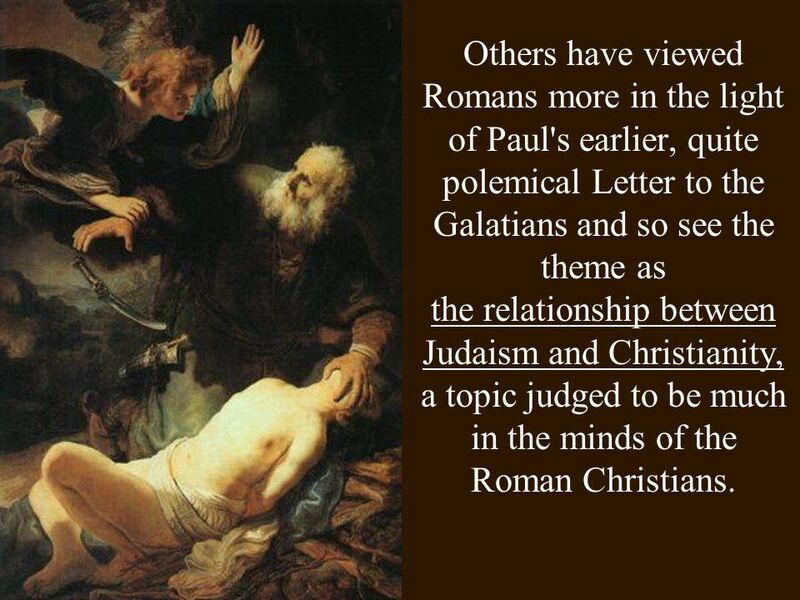 Others have viewed Romans more in the light of Paul's earlier, quite polemical Letter to the Galatians and so see the theme as the relationship between Judaism and Christianity, a topic judged to be much in the minds of the Roman Christians. 17 Each of these religious faiths claimed to be the way of salvation based upon a covenant between God and a people chosen and made the beneficiary of divine gifts. 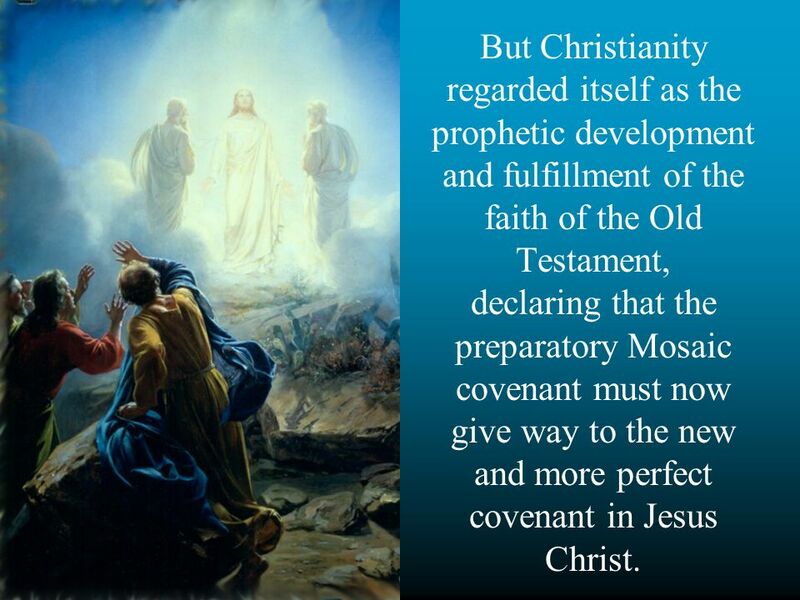 19 But Christianity regarded itself as the prophetic development and fulfillment of the faith of the Old Testament, declaring that the preparatory Mosaic covenant must now give way to the new and more perfect covenant in Jesus Christ. 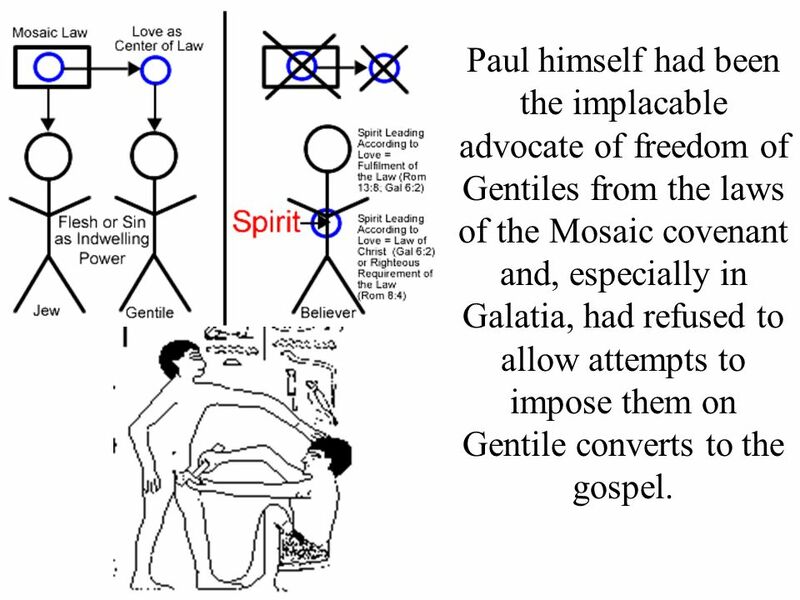 20 Paul himself had been the implacable advocate of freedom of Gentiles from the laws of the Mosaic covenant and, especially in Galatia, had refused to allow attempts to impose them on Gentile converts to the gospel. 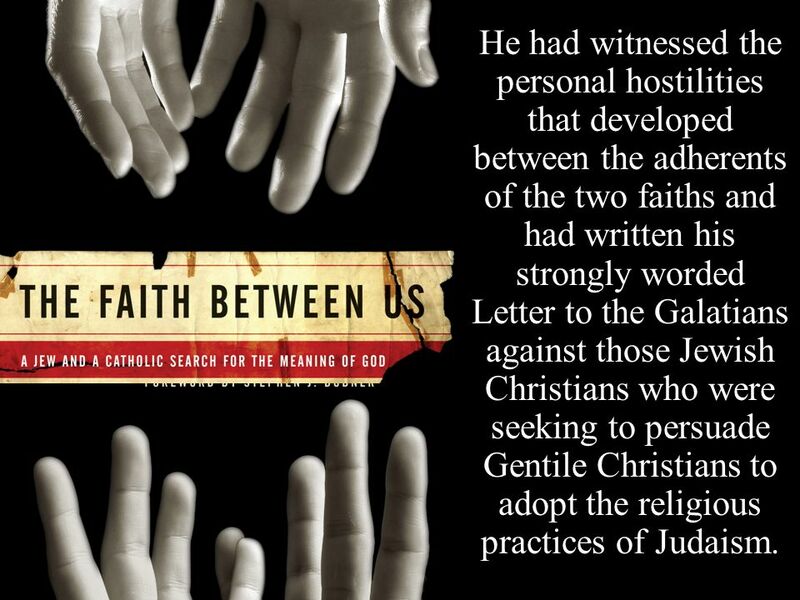 21 He had witnessed the personal hostilities that developed between the adherents of the two faiths and had written his strongly worded Letter to the Galatians against those Jewish Christians who were seeking to persuade Gentile Christians to adopt the religious practices of Judaism. 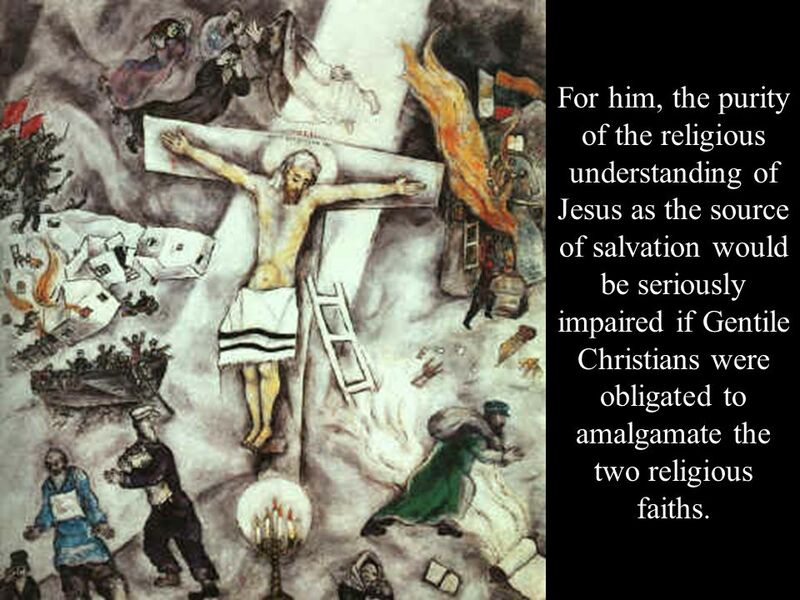 22 For him, the purity of the religious understanding of Jesus as the source of salvation would be seriously impaired if Gentile Christians were obligated to amalgamate the two religious faiths. (as expressed in Romans 9-11) to be the heart of Romans. 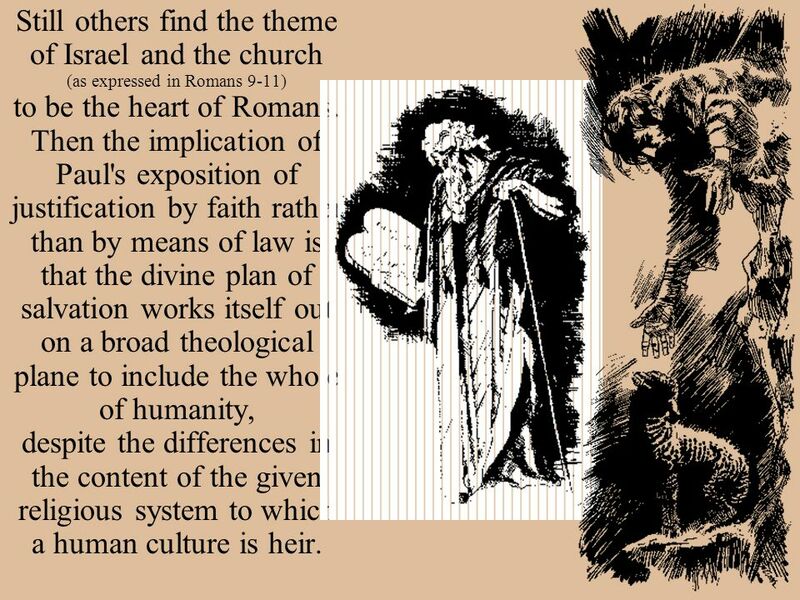 Then the implication of Paul's exposition of justification by faith rather than by means of law is that the divine plan of salvation works itself out on a broad theological plane to include the whole of humanity, despite the differences in the content of the given religious system to which a human culture is heir. 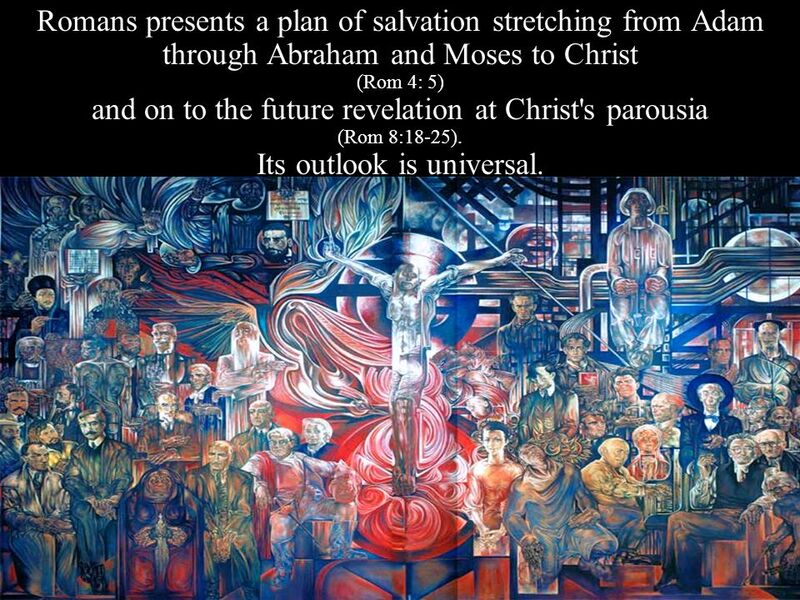 Romans presents a plan of salvation stretching from Adam through Abraham and Moses to Christ (Rom 4: 5) and on to the future revelation at Christ's parousia (Rom 8:18-25). Its outlook is universal. 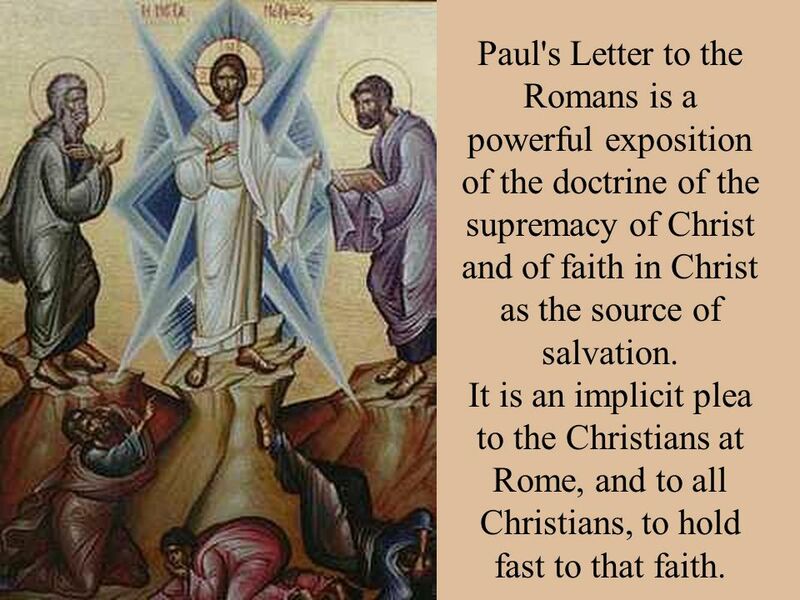 25 Paul's Letter to the Romans is a powerful exposition of the doctrine of the supremacy of Christ and of faith in Christ as the source of salvation. It is an implicit plea to the Christians at Rome, and to all Christians, to hold fast to that faith. 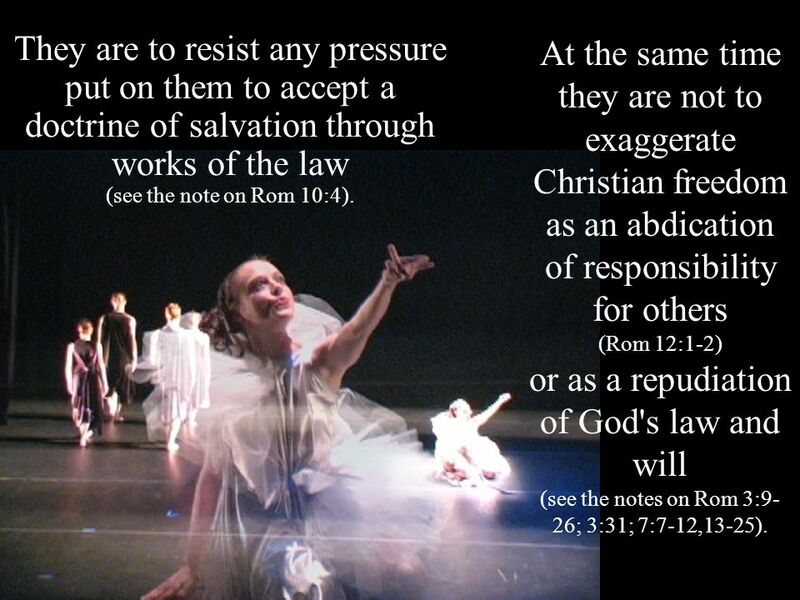 They are to resist any pressure put on them to accept a doctrine of salvation through works of the law (see the note on Rom 10:4). At the same time they are not to exaggerate Christian freedom as an abdication of responsibility for others (Rom 12:1-2) or as a repudiation of God's law and will (see the notes on Rom 3:9-26; 3:31; 7:7-12,13-25). 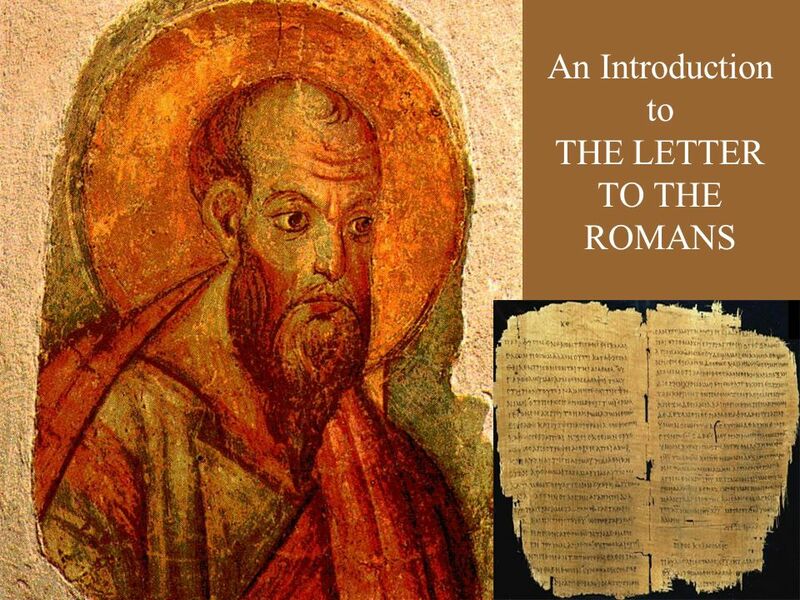 Download ppt "An Introduction to THE LETTER TO THE ROMANS." Galatians Chapter 2 Outline of the book of Galatians Justification By Faith Apart From the Law I. Pauls Defense Of His Apostleship (1-2) II. Justification. 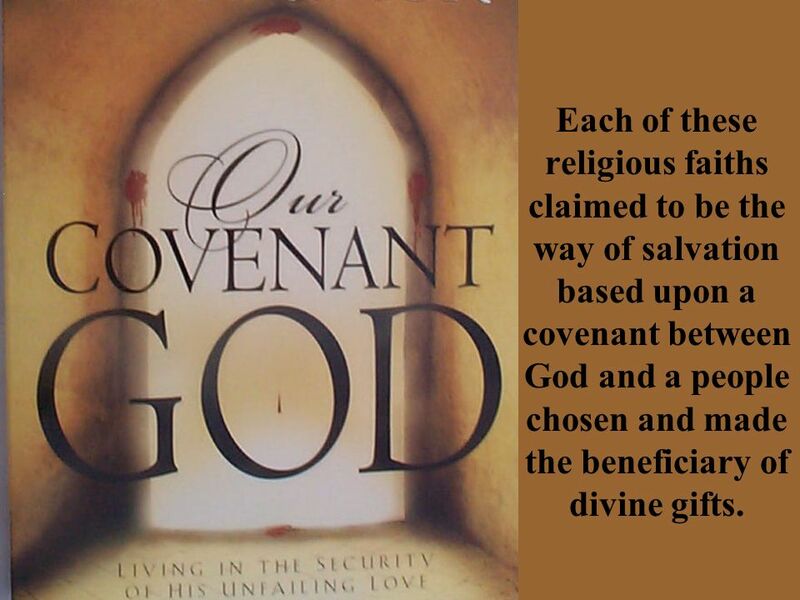 Covenants Covenant God made with Noah and every living creature. 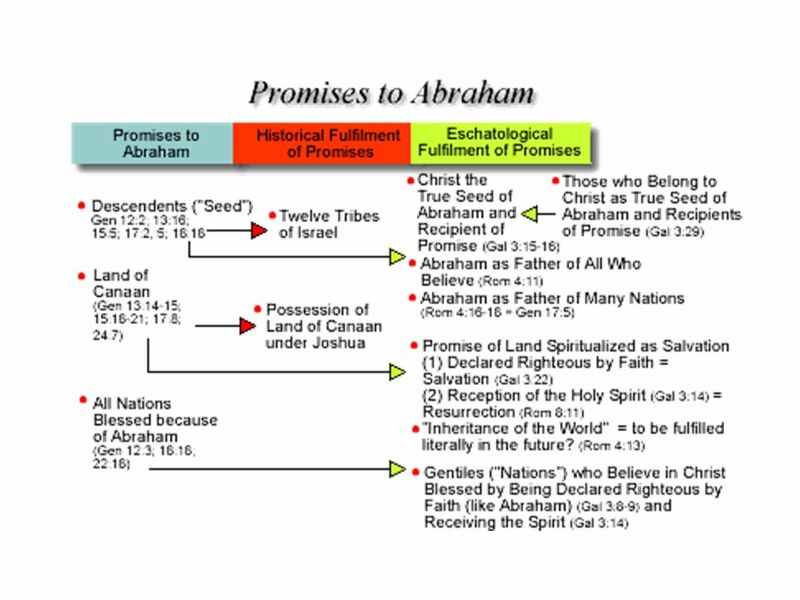 Gen. 9 Covenant God made with Abraham. Gen. 17 Covenant God made with Israel. Ex. 24:7-12. Pattern of Redemption John 19: Fractals Huh? Examples From nature A Mandelbrot set. Wise people live as Cross-centred people – 1Cor.1:10-3:23 1.The problem - 1:10-17 a. Divisions in the church b. The divisions were symptoms that:- 1. They. Know that I Am the Lord That you will Know that I Am the Lord Found some 62 times in 27 of the 48 chapters Flushes out 5 major concepts The Nature of. Ps. 81:12, So I gave them up unto their own hearts' lust: and they walked in their own counsels. Gods wrath revealed against those who hinder the truth. Romans 2: R O M A N S chapter two I. 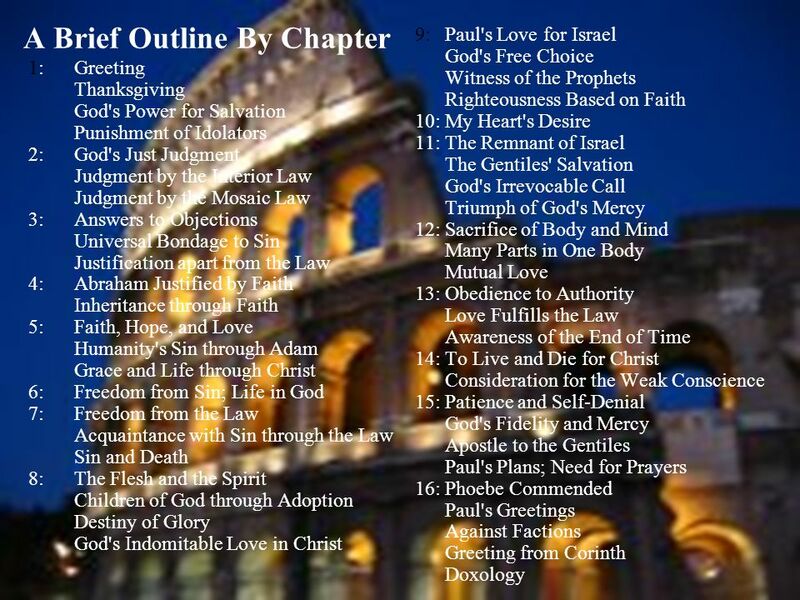 An introduction to Romans [1:1-17] For there is no partiality with God Pauls declaration that the gospel reveals.